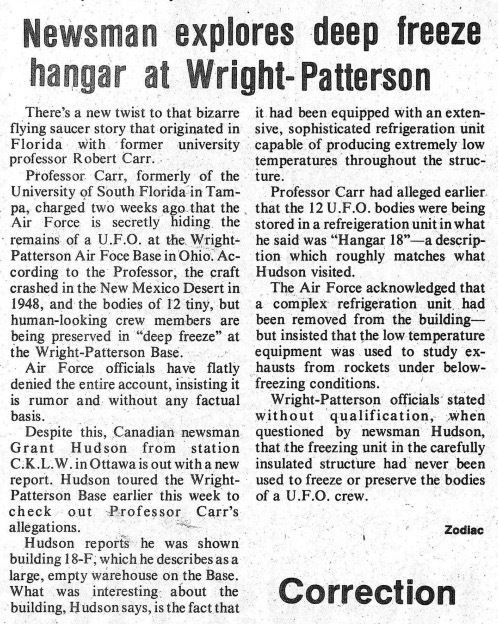 The News Record (University of Cincinnati) Nov. 5, 1974 carried the ZNS story stating that Grant Hudson, a Canadian newsman, found that building 18F had once housed refrigeration equipment used for rocket fuel testing. That was close enought for Carr. He insisted that the CIA moved the evidence after he exposed them. It was reported that Carr’s tale bore many similarities to The Fortec Conspiracy novel by Richard M. Garvin and Edmond G. Addeo. The book was not traditional science fiction, really a mainstream thriller fueled by flying saucer intrigue. The main character, Barney Russom was seeking answers about the suspicious death of his brother at the Foreign Technology Division of Wright-Patterson Air Force Base in Ohio. The mystery centered on the deadly secret of six small humanoid bodies preserved in fluid within glass tubes, aliens recovered from a flying saucer crash. 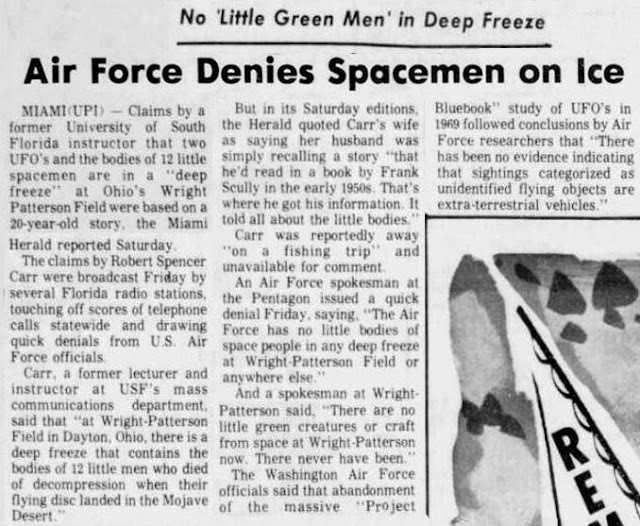 There have been, I learned, after I started the research, frequent and continual rumors (and they are only rumors) that in a morgue at Wright-Patterson Field, Dayton, Ohio, lie the bodies of a half dozen or so small humanoid corpses, measuring not more than four and a half feet in height, evidence of one of the few times an extraterrestrial spaceship has allowed itself either to fail or otherwise fall into the clutches of the semicivilized Earth people. Carr was accused of taking his story from the novel, but both were drawing from UFO legends that dated back to 1949. 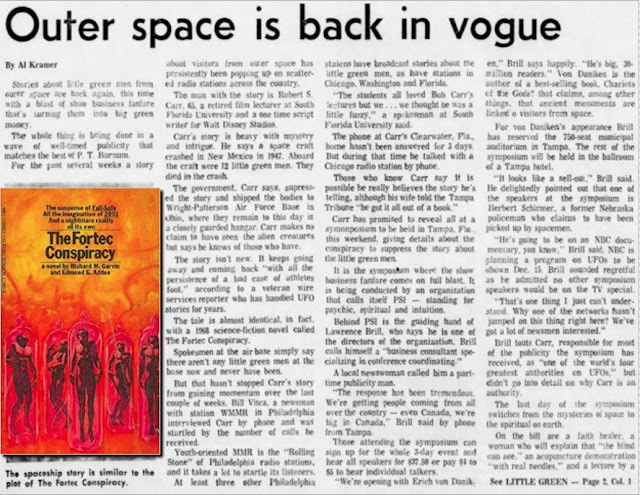 It was mistakenly reported that Carr had taken the location, “Hangar 18” from the novel, but in The Fortec Conspiracy, the alien bodies were stored in a laboratory in “Building 828, Foreign Technology Division.” When asked, Carr said “Ah, I've never read the book," but the novel was taken from a real incident." None of his claims can be traced directly to it, but there was another, older book that we can be certain that Carr did read. Silas Newton, Frank Scully, and the book they made. The book that Mrs. Carr couldn’t reach was Frank Scully’s 1950 best-seller, Behind the Flying Saucers, which told Silas Newton’s story of how in 1948, little men were found in a saucer in Aztec, New Mexico. 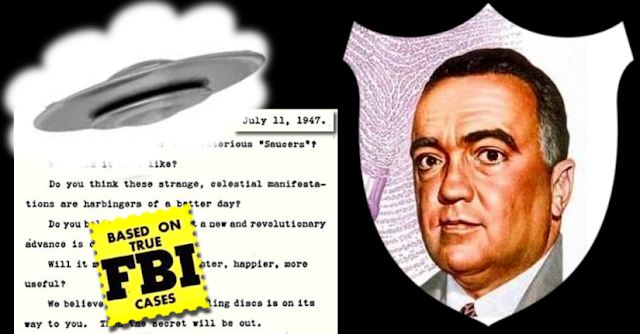 What Carr did was not only resurrect the first saucer crash tale, in effect, he “rebooted” it, embellished it, and populated it with several anonymous military eye-witnesses. Carr was faithful to Frank Scully’s Aztec narrative, but not his numbers; Scully’s saucer was 99.99 feet in diameter with 16 bodies found inside. For some reason, Carr kept all the other details, but reduced the numbers to a 31-foot diameter saucer with 12 bodies. Perhaps Carr's most brilliant touch was in giving the hiding place for the saucer and bodies a name, “Hangar 18,” which made it all sound so much more authentic. Like Scully, Carr worked the fact that the Government and military keeps secrets, and claimed there was a cover-up. Therefore, any official denial of UFOs was, in effect, confirmation. The (Miami) Herald quoted Carr's wife as saying her husband was simply recalling a story "that he'd read in a book by Frank Scully in the early 1950s. That's where he got his information. It told all about the little bodies." Dr. Gee said that some of them had been dissected, and studied by the medical division of the Air Force and that from the meager reports he had received, they had found that these little fellows were in all respects perfectly normal human beings, except for their teeth. There wasn't a cavity or a filling in any mouth. Their teeth were perfect.From the characteristics and physiology of their bodies they must have been about 35 to 40 years of age, judged by our standards of age. 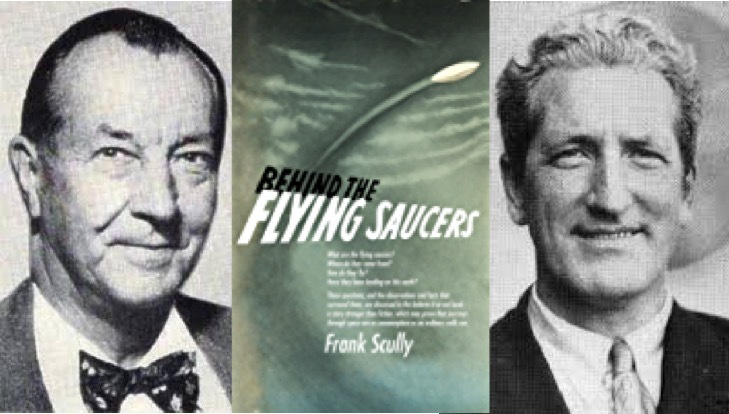 Behind the Flying Saucers propelled Frank Scully and Silas Newton into the spotlight and they were honored guests at the earliest flying saucer conferences. Before and after the Scully book, the captured saucer story was told, imitated and and retold, with many variations of it circulated. (See appendix, “The Road to Hangar 18.”) Major Donald Keyhoe, investigated the Aztec story while researching his book, Flying Saucers are Real. "...the little men story had turned out-as expected--a dud... a big joke. But in spite of this, the little men story goes on and on." In 1974 Carr took Silas Newton’s forgotten Aztec story and gave it new life, repackaging for a generation disillusioned by the assassination of President Kennedy, the Vietnam war and the Nixon Watergate scandal. 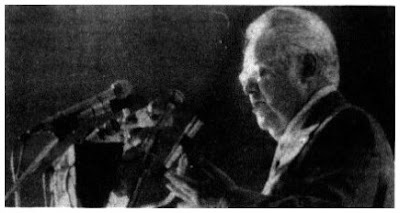 In the days leading up to his lecture at the UFO conference, the pressure for media interviews was so fierce that Carr had to hire Lawrence Brill as his manager and go into hiding to get any rest. Carr emphasized that the saucer was not shot down, just had suffered an accidental decompression which killed the crew of twelve. He described the fantastic technology and the advanced beings within, who were small humans. Carr supported the conference’s star lecturer, Erich von Daniken’s in his Ancient Astronaut theory: “Either we are their lost colony or they are our lost cousins... Undoubtedly, there has been an unbroken link going back a long time.” The punchline for the crash story was that all the knowledge from this was being hidden where it would do us no good, under lock and key by the CIA at Wright-Patterson’s Hangar 18. Carr’s hour-long lecture was short on specifics, but in the question and answer session afterward, he was asked about his sources for the information. Carr said there were three witnesses, but they must remain unnamed. Carr repeated his declaration that the US government would end the cover-up, admit that UFOs were really spacecraft from other worlds, and it would happen soon - before the end of the year. Fortunately, Carr's lecture was recorded, and portions of it were included in UFOs: Fact or Fiction, a radio documentary broadcast on the Washington, DC station WWDC. Steven W. Kaeser hosts segments from the program and a transcript of Carr’s talk. In our next chapter, we take a look at the reaction from the UFO community, Carr’s legacy and how it changed the world. So Hanger 18 came from the Aztec UFO crash story, I'd always heard it bought up in connection to Roswell. I'll be very interested to read the next part of this series as the evolution of this tale over time is going to be fascinating. As to 'unnamed sources' well they can say whatever you want them to say, it's not as if anyone can contact them to double check the claims. I'd give just about anything to get my hands on Carr's diaries/lecture notes from that period, if only to see where that story really came from.